I have never thought of writing for reputation and honor. What I have in my heart must out; that is the reason why I compose. For this unit study we did things a little different. After reading a bit of background information about Beethoven we pulled out the paints, pencils and coloring pages and started coloring and drawing while listening to his music. (Links to music are listed under Classics for Kids link) Not only was it relaxing the multi sensory experience helped the children engage more in the music. after coloring for a time. We stopped and read the bit of trivia about Beethoven's hair. records), Beethoven had a miserable childhood. He was one of seven children, only three of whom survived to adulthood. Although he loved his gentle mother, Maria, he feared his hard‐ drinking, demanding father, Johann. Johann had no great talent, but he gave music lessonsto the children of the nobility. From the time Ludwig was a small boy, turning the iron handle of window shutters to hear the musical noise, the child had been absorbed by music. His father recognized the boy’s ability and nurtured it, possibly because he saw it as a source of income. Beethoven’s stay was cut short by a series of family tragedies. He returned to Bonn to his dying mother. Shortly after, his infant sister died. When hisfather lost his job, Beethoven had to take responsibility for the family. After his father’s death in 1792, Beethoven returned to Vienna for good. The serious boy had grown into a man who was by turns rude and violent, kind and generous. He helped raise money forthe only surviving child of Johann Sebastian Bach, who was living in poverty, and he donated new compositionsfor a benefit concertin aid ofUrsuline nuns. Beethoven, other well-known composers from this period include: Bach, Stamitz, Haydn, Salieri, Mozart, and Schubert. Most of the famous composers of that period were from Europe. Beethoven composed nine symphonies. Lots of other composers wrote more than that, but Beethoven’s Symphonies are very famous and have some distinguishing characteristics. His Third Symphony, for example, was the longest symphony ever written at that time. The beginning of the second movement of Beethoven’s Eighth Symphony imitates a metronome. Beethoven's Ninth was the first symphony to use voices and his Fifth Symphony may be the most famous piece of music ever written. Beethoven, the great composer, was ill for much of his adult life. He was also totally deaf when he created some of his best work. Before he died, he wrote a letter to his brothers, begging them to find out why he had been in such poor health. That letter is referred to as the Heiligenstadt Testament. Locks of the maestro’s hair, snipped from his head at the time of his death, have provided the answer Beethoven sought for so long. He had lead poisoning! Beethoven: The Story of a Little Boys Who Was Forced to Practice by Thomas Tapper, which is in the public domain and can therefore be downloaded for free for Kindle or other ebook readers. 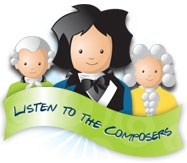 Classics for Kids -- Mozart Six different programs related to Mozart. “Brothers and Sisters to the Rescue” and “Annie and the Beanstalk” both feature the theme from the 5th Symphony. HERE ARE SOME RECOMMENDED RESOURCE available for purchase for those who want to extend and expand their composer studies. *we have not used all these specific resources as my children don't enjoy lap books - which is disappointing as the teacher thinks they are facinating! I can confidently recommend these companies as we have purchased resources or used their free samples throughout the years. 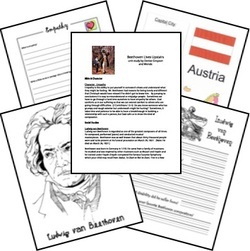 World’s Greatest Composers curriculum is to immerse students in the work of each composer so that they are well familiar with their style, methods and music. a long winded through interesting article on all aspects of Beethoven's life and compositions is here.